Vietnam’s press watchdog has suspended Tuoi Tre Online, the Vietnamese-language online platform of Tuoi Tre (Youth) newspaper, for three months over journalism and publishing violations. 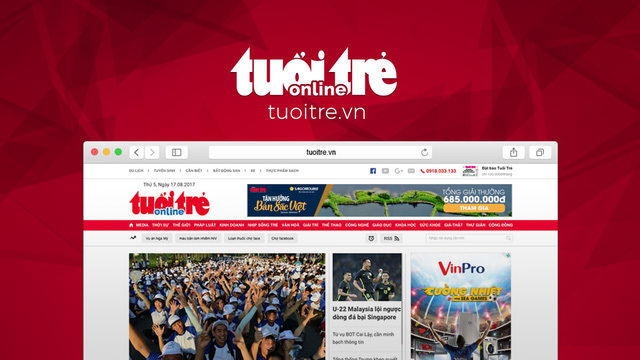 Tuoi Tre Online, accessible at tuoitre.vn, will temporarily stop publishing new stories for three months from July 16, according to a decision issued the same day by the Authority of Press under the Ministry of Information and Communications. The order, signed by Luu Dinh Phuc, directorate general of the Authority of Press, states that Tuoi Tre Online reported untrue information by misquoting Vietnamese State President Tran Dai Quang in a June 19 article, and information “splitting national unity” in the reader comments of a May 26, 2017 story. The news site was asked to rectify the false information and pay a fine of VND220 million ($9,500). Tuoi Tre Online published the corrections on Monday night. The suspension affects the online Vietnamese publication of the Ho Chi Minh City-based Tuoi Tre newspaper, one of the country’s largest dailies by circulation, as well as its Internet TV platform, which shares a publishing license with Tuoi Tre Online. Tuoi Tre is a media group that consists of the daily Tuoi Tre, Tuoi Tre Online, the socio-political weekly magazine Tuoi Tre Cuoi Tuan, the satirical magazine Tuoi Tre Cuoi published twice a month, Tuoi Tre TV, and the English-language publication Tuoi Tre News. Tuoi Tre Online said on Monday it will take the three-month hiatus to boost reform and renovation for its content and fortify personnel development to better serve readers when it comes back.